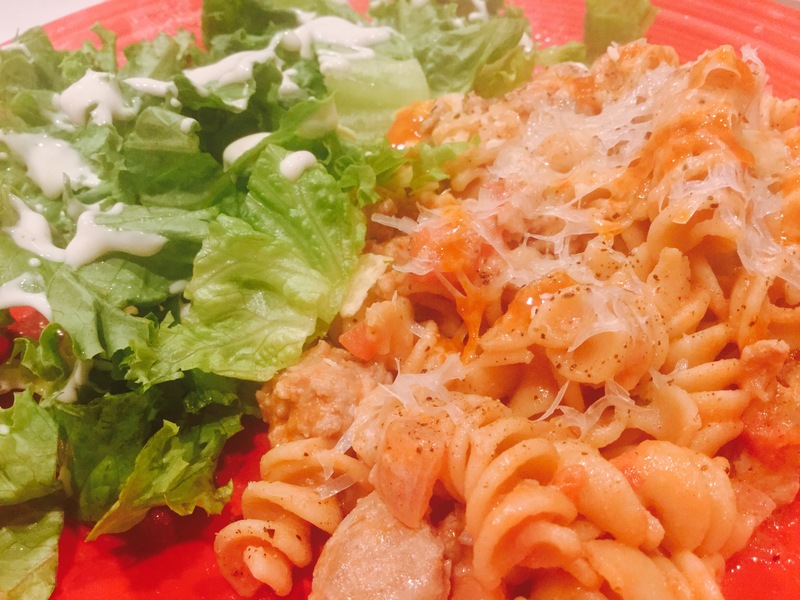 Italian Sausage and Spicy Cream Sauce Over Pasta – Low-fat, Easy and Delicious!!! For some reason the turkey Italian sausage is always marked down at my local grocery store. I can’t resist a good deal, so I have a bunch of that sausage in my freezer. I figured I better use some of that stuff! I make my marinara sauce quite frequently, so I wanted to try something a little different last night. This spicy cream tomato sauce was delicious!!! Since I used sweet sausage, the dish wasn’t overly spicy, so even the sensitive palette would enjoy it, but you could easily spice it up even more by using spicy sausage and adding additional red pepper flakes. This would be an easy dish to multiply and serve to a large group too! I cooked in my dutch oven, but you could also use a large skillet. Spray pan with olive oil spray and heat to medium high heat. Add onions and cook until tender. Add sausage and cook, breaking up into small pieces. When sausage is almost completely browned, add garlic and cook another minute. Add all tomato products, stir well and reduce to low. Allow to simmer for 30 minutes. While the sauce is simmering, you can boil your pasta in salted water. In the last couple minutes of sauce simmering, add the half and half and cheese and stir. Drain pasta and pour into large bowl. Spoon sausage and sauce over pasta and serve. 8 servings. 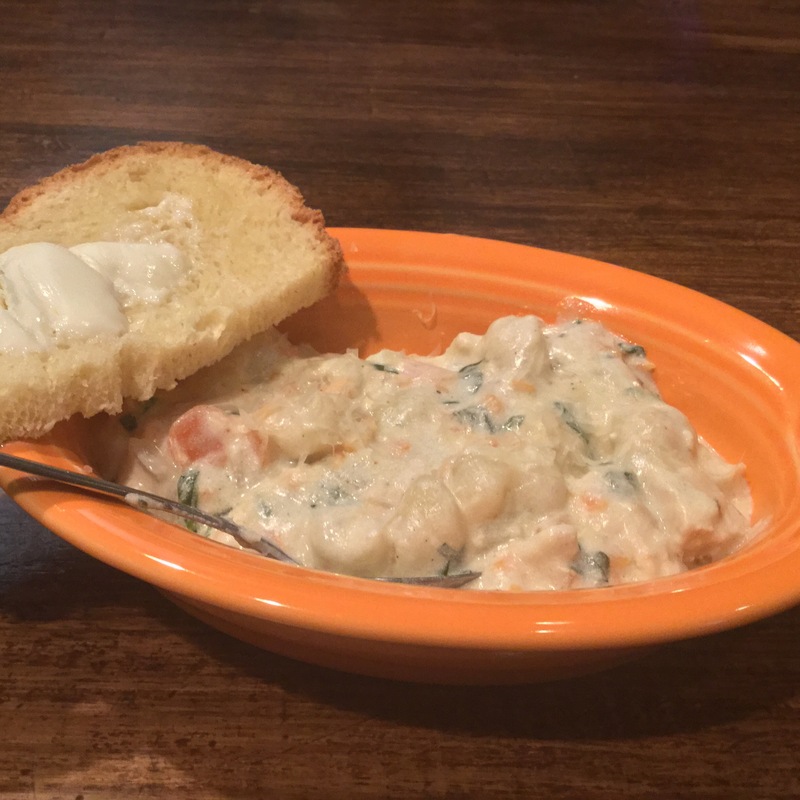 Creamy Gnocchi Soup with Spinach – Warm, Creamy Goodness!!! I just love gnocchi!! They are wonderful, fluffy little pillows of potato-ey goodness! Now you add some veggies and a generous amount of creamy sauce and you have a tasty, comforting soup that will warm your soul this fall and winter! This creamy sauce could get out of control with the fat content, but in an effort to keep this reasonable I used fat free creamer to keep the fat content down. I also used pre-made gnocchi, which made this dish quick and easy to make. 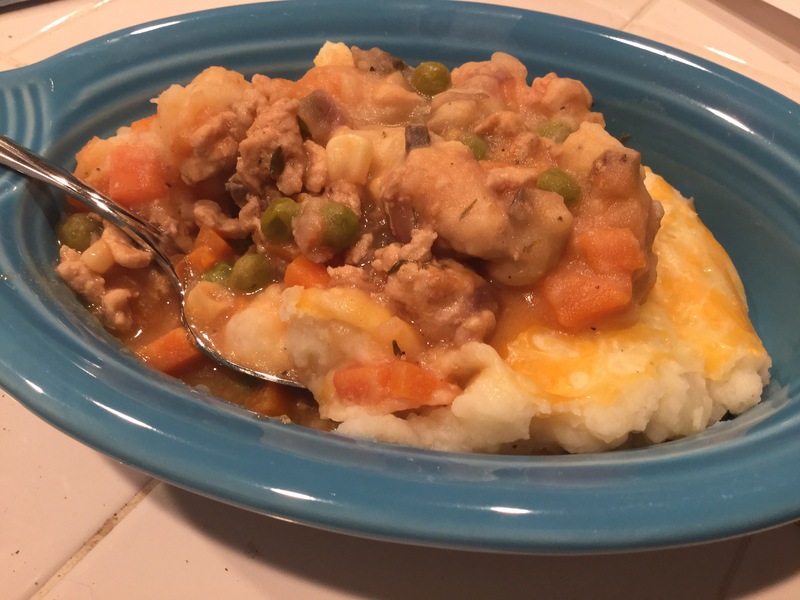 Leaving out the chicken would easily make this a delicious and still hearty vegetarian meal! Spray a frying pan with non-stick spray. Saute the onion, garlic, carrot over medium heat until onion is translucent. Mix cornstarch and 2-3 tbsp of half and half in a small bowl until smooth, set aside. Add chicken, chicken stock, half and half, salt and pepper, thyme to frying pan and then stir in cornstarch mixture. Heat to boiling, then add gnocchi. Gently boil for 4 minutes, then turn down to a simmer for 10 minutes. 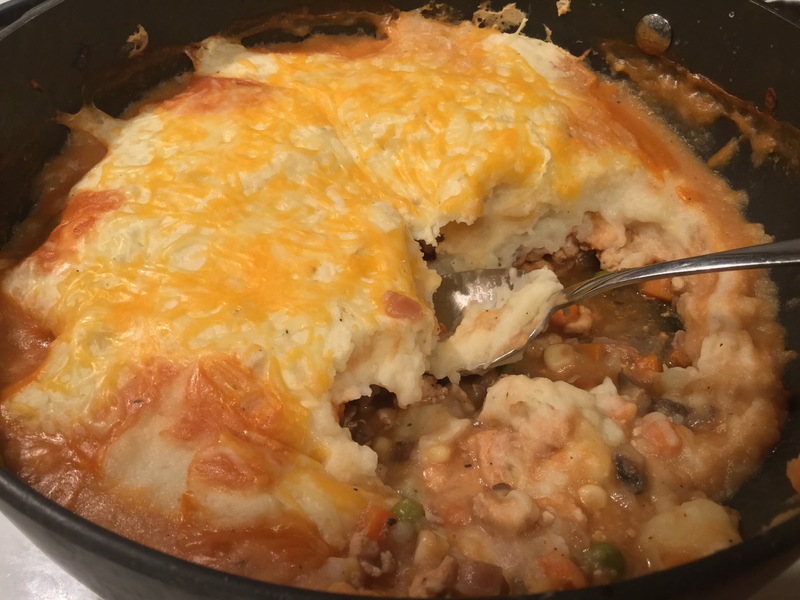 Shepard’s Pie – A Healthier Version of a Warming Classic! It’s officially fall and getting to be the time of year where we crave warm, comforting food. I was trying to think of something I hadn’t made in a while and Shepard’s Pie came to mind. This is one of those wonderful dishes that provides everything in one dish; meat, potatoes and vegetables. I used low-fat ingredients to make a lighter version and I was very happy with how it turned out! It had all the delicious flavor and hearty textures you would expect of Shepard’s Pie, without being loaded with fat. You can get creative with the vegetables in this dish. My recipe includes what I had on hand, but you could substitute a variety of things. You could also completely replace the potatoes with sweet potatoes or do a half & half version. Get creative with it!!!! Mashed potato topping: Boil potatoes in salted water until soft. Drain potatoes and return to pot. Mash potatoes. Add milk, sour cream, garlic and salt & pepper to taste. Mix well until smooth. Make your pie filling while potatoes are cooking. I used an oven safe deep frying pan, so I could use it for my final product and not dirty another pan. Preheat oven to 375 degrees. Pie filling: Spray frying pan with canola oil spray. Over medium high heat, saute carrots and onion until tender. Add garlic and mushrooms and saute another couple of minutes. Add turkey and cook until browned. Add the flour, salt and pepper and stir well. Add remaining ingredients. Bring to a boil and then reduce heat to low, cover and simmer for 10-12 minutes or until sauce thickens. Remove filling from heat and allow to cool for 5 minutes or so. Spoon mashed potatoes over filling in frying pan and spread to cover evenly. Bake uncovered in oven for 30 minutes. Remove from oven and sprinkle with cheese, if you wish and bake for an additional 15 minutes. Remove from oven and let sit for 10 minutes. 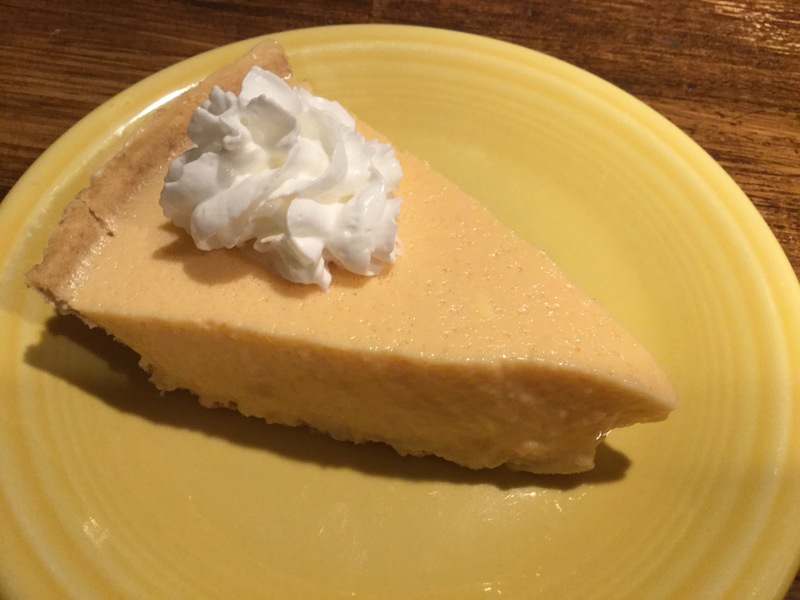 Canteloupe Pie – Say What??? That’s a New One!!! My friend Jody posted this recipe on FaceBook and I couldn’t believe my eyes! Canteloupe pie!?! I’d never heard of such a thing, but my curiosity was peaked. The cantaloupes here in California have been wonderful this year, so as soon as I received one in my organic produce shipment I knew I had to try and make this pie. Just as it sounds, it is light and refreshing! Canteloupe, cream cheese and a little orange juice mixed, chilled and served in a graham cracker crust makes for a cold, refreshing pie that is perfect to serve on hot summer day! In a food processor, process cantalope until as smooth as you can get it. Pour 1/2 of mixture into a large bowl. Add cream cheese to remaining mixture in food processor and process until smooth. Add to cantalope in bowl and gently mix. In a small saucepan combine juice, sugar, and gelatin. Cook on low heat, stirring constantly, until sugar and gelatin are completely dissolved. Slowly stir into cantalope mixture, add vanilla. Pour into chilled crust, refrigerate until completely set. Top with whipped cream and serve. Depending on the size of your canteloupe, you might have extra filling. Don’t overfill your crust (like I did!!!). Save the extra, pour in bowls and enjoy as a pudding!